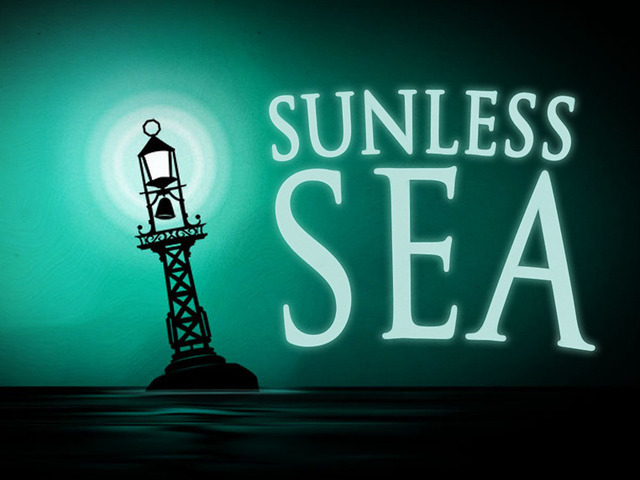 I’ve already talked at length about how much I love Fallen London and Failbetter Games, so it probably comes as no surprise that I threw my money at their Sunless Sea Kickstarter. The beta build launch on last Tuesday, and I finally got a chance to play. All the best parts of Fallen London are at here: the witty, eloquent prose, the intriguing characters and plots, the limited but beautiful art. 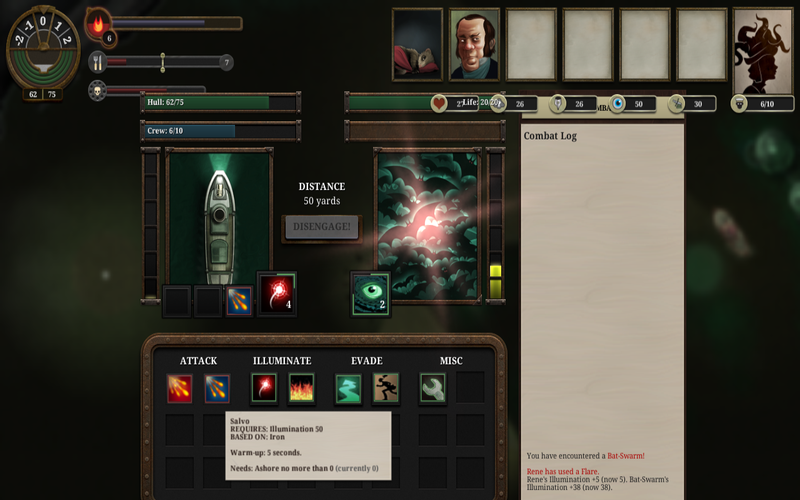 They’ve also added haunting music and new mechanics to really set apart Sunless Sea as a unique game in this universe. Unfortunately, all of those elements are undermined by the roguelike nature of the game. 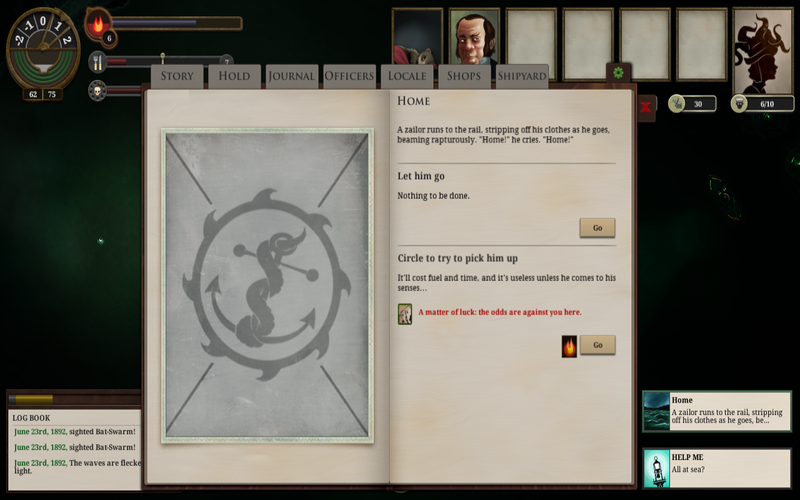 Fallen London, as a point and click browser card game, allows the reader to leisurely explore the world, and few decisions result in player death. 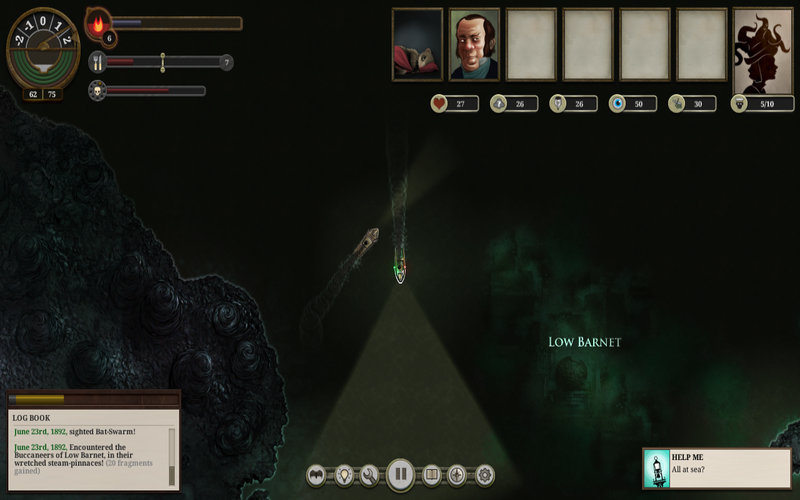 Sunless Sea is a much crueler mistress, and as a result, its hard to relax and enjoy the scenery that has been so lovingly crafted. A friendly ship coming to say hello? Nope, just more pirates. This game is hard. In the first run, I was killed within minutes by pirates because I didn’t understand how the combat system worked. The second run, I ran out of supplies making a short run up to the Tomb Colonies and my crew resorted to cannibalism. The third run, my terror got too high and my crew mutinied. The in-game “help” menu is vague, and its unclear how seemingly unimportant decisions may affect the long term health of your captain. There are no training wheels, and there is not tutorial level. The frequent death is even more frustrating because character creation and launch from the harbor is fairly repetitive. Choosing from the same four options for character past gets old very quickly. Seriously, how the hell was I supposed to find the combat button hidden under my stats? The challenge is intentional, of course. The creators have repeatedly said that this game is not supposed to be easy, and their insistent on the rogue-like genre begs further examination. The weird marriage of story and rogue-like means that every victory brings an even greater sense of euphoria, and every defeat becomes that much more agonizing. Just like before, player action creates a narrative that is truly unique to each play through. Fallen London’s teeth really come out, and the world that the players thought they knew becomes much more frightening– and enticing. The game lends itself to roleplaying, and I found myself imagining how my captain would react to situations in the game, rather than how to “win”. My grizzled veteran did not care if the entire crew jumped off the ship. We weren’t wasting any more fuel on fool’s errands. Despite my frustrations, I still have great hope for the game. It is still in beta, and the creators admitted they really ramped up the difficulty for their soft release to Kickstarter backers. Failbetter has a chart to plot the progress of the game, which reveals that only 32% of the fiction is implemented, 33% of the world is implemented, and phenomena is at a measly 10%. What content is present is polished to a shine, and I can’t wait to see what the full game will be. So in the meantime, if you need me, I’ll be sailing the Unterzee. Sunless Sea will be avaliable for early release on Steam July 1. You can also purchase it now through the Humble Bundle.